Breanne Williams. Bruton Memorial Library is now renting out hotspots. Bruton Memorial Library is now offering wifi hotspots for library members to check out and use at their homes. We’re living in a technology-focused world. Nearly every aspect of people’s lives revolve around being able to have access to the ever evolving electronics and machinery that make up our society. Bruton Memorial Library is hoping to ease that burden by offering the rental of hotspots for library members. The Friends of the Bruton Memorial Library funded the new project and the library currently has four hotspots as it kicks off its pilot program. The goal is to eventually have at least a dozen down the road if the community proves there is a need for the portable devices. Patrons need to have a current library card and be in good standing — there can’t be any debts on the account — to check out a device. Because the library doesn’t hold youth responsible for lost items only those 17 and older are allowed to check out the hotspots. Your photo ID will also be required to take home the device. The items are valued at $144, so if lost or damaged the person who checked it out will be liable for the replacement fee. Because library staff will need to plug it in and make sure it’s working when it’s returned the person bringing it back needs to take it to the desk and not just toss it in the return box. If the device isn’t returned and the fee isn’t paid, your account will be blocked until the issue is taken care of. Bruton is opening up a massive window for the checkout of the items as library patrons can check them out and keep them for 14 days. When they bring it back they have to wait at least three business days before they can check out another one. In laymen’s terms that means anyone who checks out the device can stream Netflix, create intricate projects on sites like PiktoChart or Canva and even upload massive files without much of a hitch. Much like the mottos found at the old Blockbusters, patrons are asked to “be kind” and instead of rewinding, they should recharge the device before they send it along to the next user. It’s not officially required, but it’s morally the right thing to do and will ensure the next customer won’t have to wait to have access to the device. Hotspots are simply devices used to provide a bubble of wireless internet. What is accessed via that internet is not being monitored or restricted by the library. No data is stored on the boxes so people don’t need to worry about their information being obtained by the library once the box is returned. Since the program is so new the items are not yet holdable online so anyone hoping to get their hands on a hotspot needs to just show up, cross their fingers and hope one is available. The library will be closely monitoring the statistics of how frequently the items are checked out and if there is evidence the community desires more they may then be able to take the steps to grow the program. 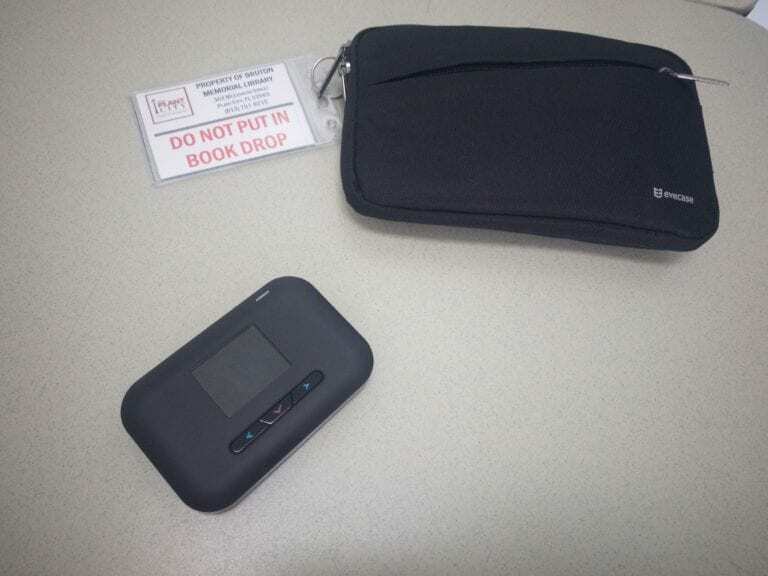 When you check out the device you’ll be given a bag with a charger and the small box inside. It’s a relatively simple process from there. You simply make sure it’s charged and then turn it on. Your device will pull up all nearby wifi options and the name of the hotspot and its password are taped to the back of the box.